Every year, the nice folks at Realmac Software band together with app developers to offer top iOS and Mac software at steep discounts. 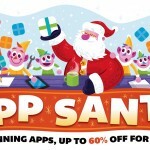 Dubbed App Santa, the sale launches today, Dec. 22, and lasts until the end of Dec. 25. You can save up to 80 percent off the regular price of apps from the likes of Realmac Software, Readdle, Tapbots, Junecloud, and more. Here’s what App Santa has in his Christmas bag for you this year. Santa also has a handful of Mac apps available at steep discounts. Just check out the full list of available titles at the App Santa Web page for all the details. There are some fantastic deals to be had, so don’t get left out in the cold.